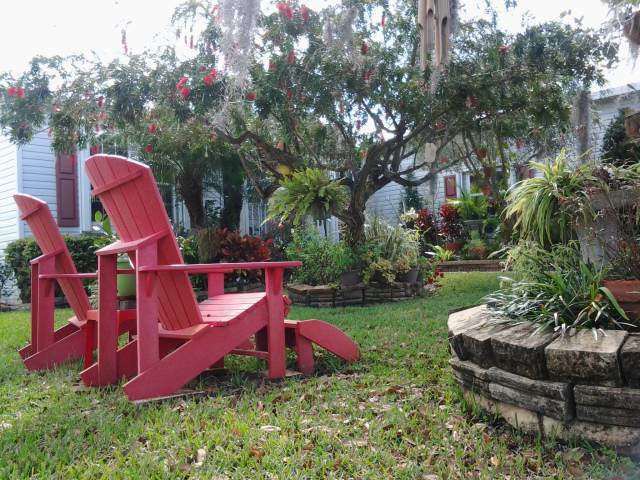 Florida has tons of beautiful manufactured home communities and within those parks are some gorgeous manufactured homes. 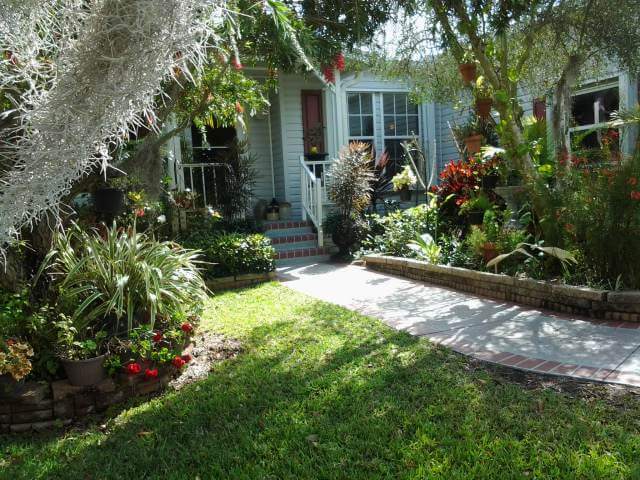 After all, Florida is the mecca of retiring in affordable style! I was fortunate enough to get to feature a beautiful Floridian double wide a few months ago. It set in a community called Lost Lakes outside of Cocoa, FL. Today, I get to feature another beautiful double wide in the same park. 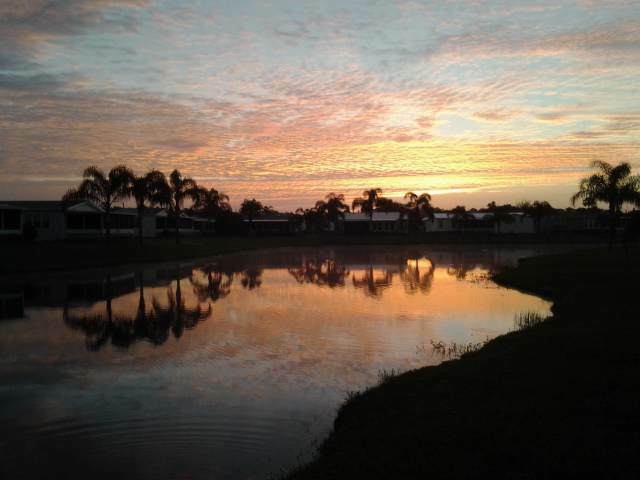 With picturesque views of the water and gorgeous sunrises and sunsets, this manufactured home park is a perfect setting for the beautiful manufactured home you’re about to see! 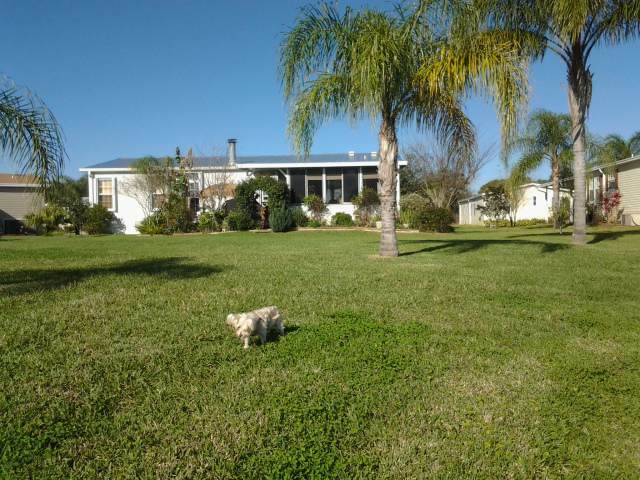 The owners, Steve and Pat Towers, own a 32′ x 50′ Classic Jacobsen Manufactured Home. They are the proud grandparents of six grandchildren, all living in the Orlando area. Anticipating their eventual retirement, they purchased a waterfront lot when Lost Lakes was being developed, with the goal of placing a factory-built home after they were both officially retired. 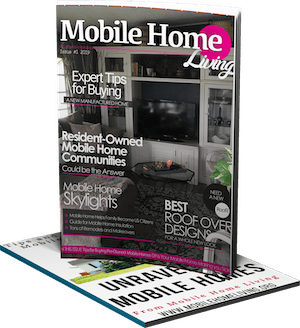 The couple met with the manufactured home builder and ordered a completely customized manufactured home that meet all their specifications and needs. 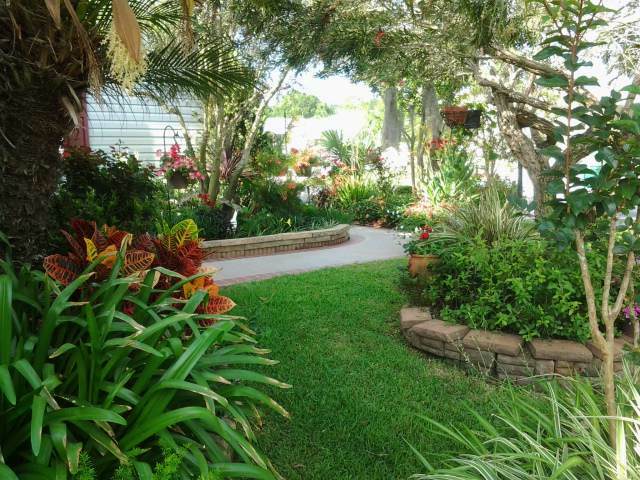 Pat moved in sooner than planned after getting transferred and Steve stayed in their original home in South Florida. The split arrangement grew old quickly so Steve retired from his position after 38 years in the education field. Once the lovely couple were settled in and had been living in the home for a few years they realized the home needed to be fine-tuned to their new living style. 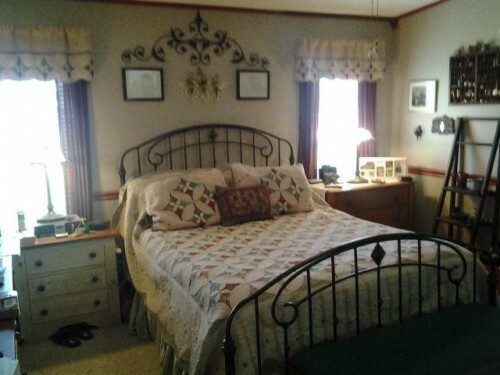 After 11 years, there’s not a room in the house that remains in its original state. 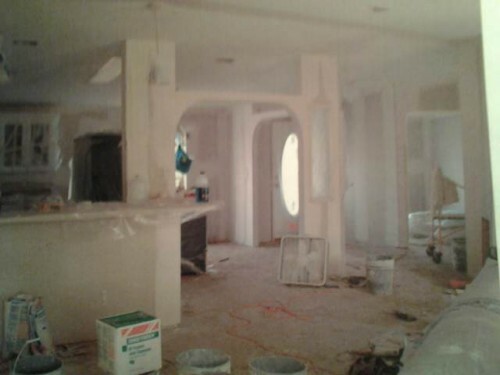 Here’s their living room and kitchen during the makeover. The first to go was the kitchen. Pat wanted all drawers, instead of doors, for the bottom cabinets. 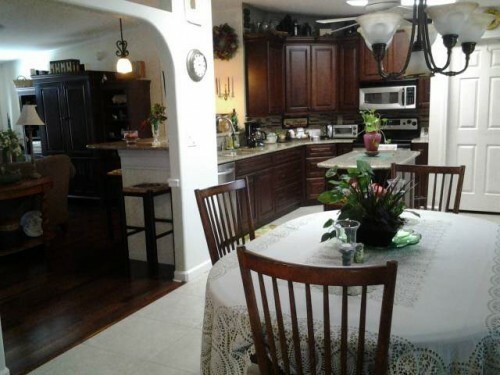 Naturally, one thing led to another and they ended up with an entirely new kitchen from floor to ceiling! Mrs. Towers designed the kitchen just the way she wanted it, granite counters, expanded cabinet lighting, and all! Slowly but surely they tackled each and every room. They created a unique look while still keeping a good “flow” to the design. 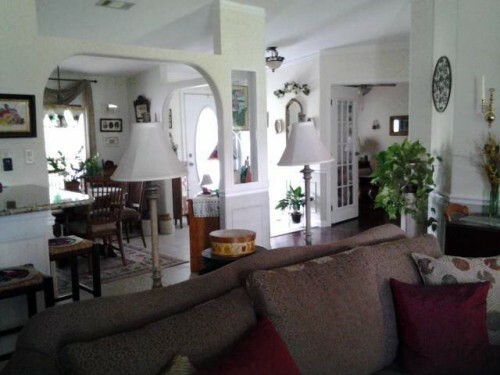 Taking out two walls and putting in French doors opened the living room to the rest of the home. 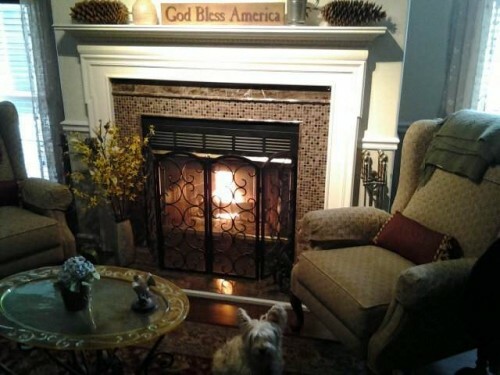 It gives the home a grand appearance when entering. Hardwood floors grace the entryway and main part of the house, giving a unified look to the home. 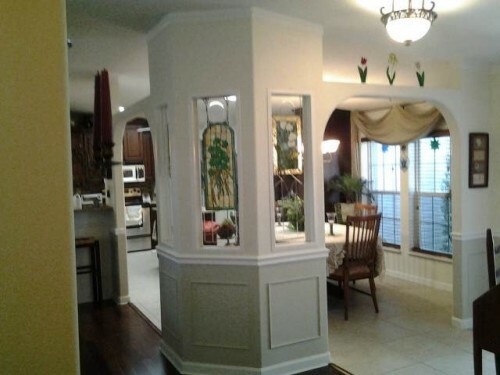 Steve, a handyman himself, enjoys woodworking so when his wife saw custom moldings on a TV home show he recreated it. 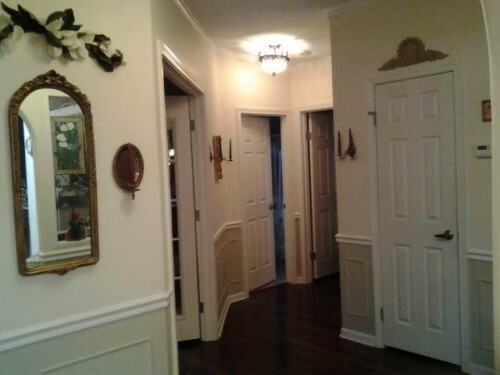 The moldings give the home a very traditional look. Even though bedroom two and three are now integrated into the main part of the house, the doors can be closed and couches folded out to create two guest rooms. This home remodel was thoroughly planned and well thought out. 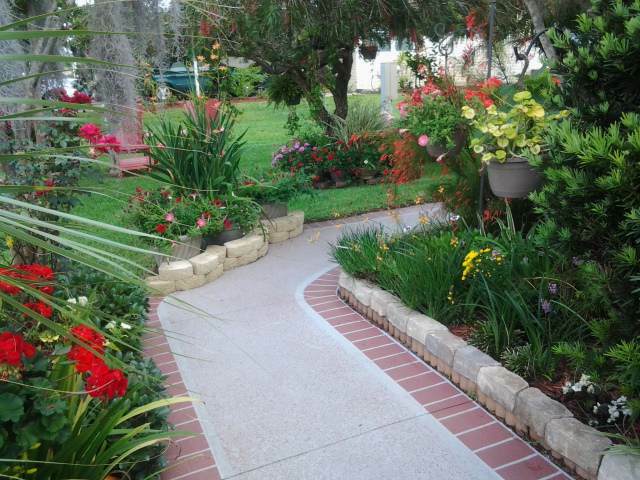 The lot is filled with gorgeous, mature landscaping too! 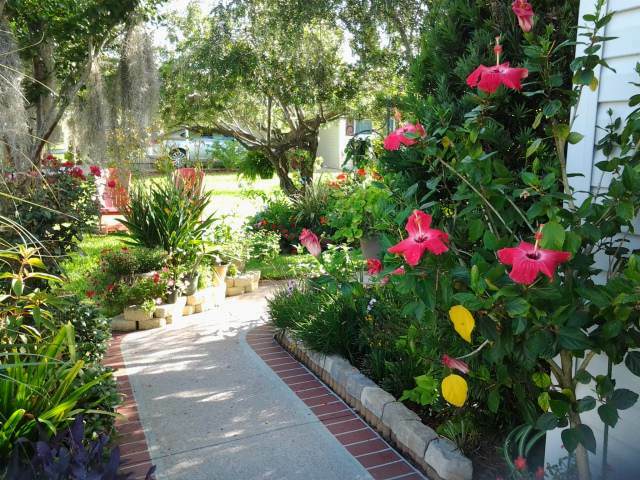 The couple has created lush tropical landscaping to enhance the curb appeal of their manufactured home. 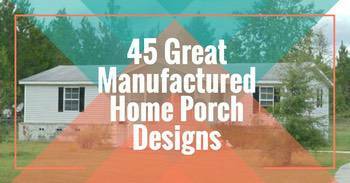 How much did your manufactured home remodel cost? It’s hard putting a cost to our overall project. All I can say it was a labor of love. Each room presented different challenges at varied costs. 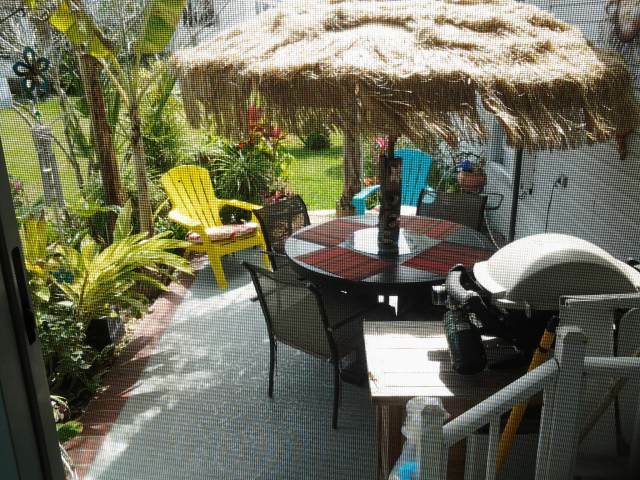 We added a lanai on the back of the house along with an area that we call “the lower deck.” Our goal was to create our own little resort paradise. Strategically located on the bend of the lake our home lends iitself towater views no matter where you stand in the house. It’s hard to say which room is our favorite. 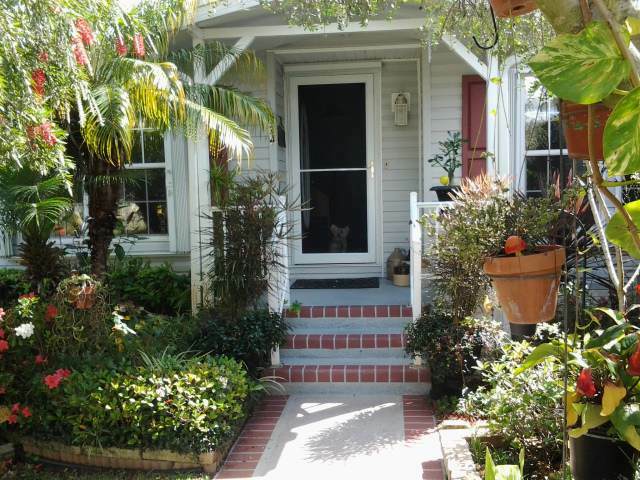 We love having our morning coffee on the lanai so we can watch the wildlife. We have seen roseate spoonbills, herons, ducks, turtles, bald eagles and even an occasional alligator! 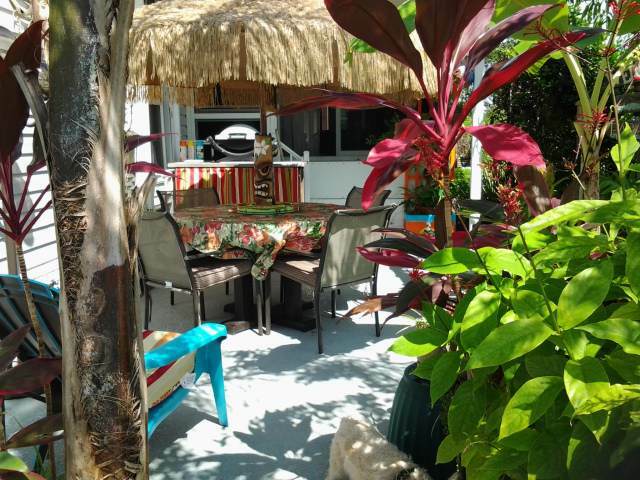 We turned the lanai into an all season room so we can enjoy it year round. My wife loves her kitchen and on any given day she’s in there creating some new culinary delight. 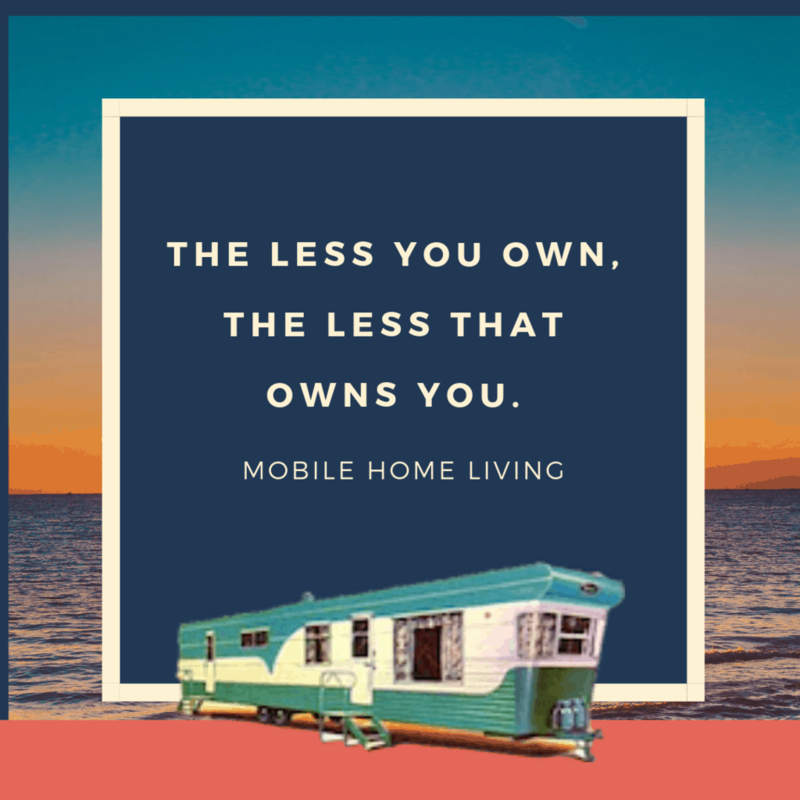 What advice would you give someone about to tackle their own manufactured home remodel? 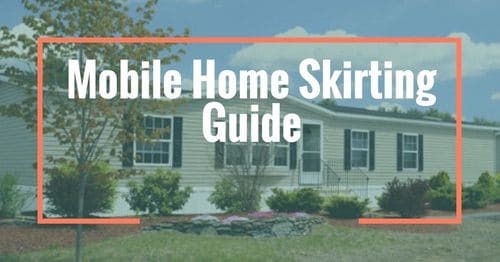 My advice to anyone considering manufactured home living is “go for it.” Considering remodeling? Think outside the box. It’s amazing what a little rearranging can do. Some examples: We moved the hot water heater from the inside of the house to the garage. This allowed us to tear out the surrounding walls creating a large storage room. The space was next to a walk-in closet so now we have floor to ceiling shelves lining all the walls of this enlarged space. Who doesn’t need storage space? The list goes on and on. I consider our home a work in progress. As long as we can dream it, we can do it. What a great home! It’s homes like this that continue to inspire me and make me realize just how great a factory-built home can be. 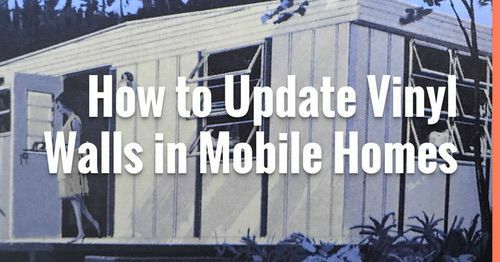 The poor image that manufactured homes get is unfair and doesn’t take into account the beauty, affordability, and convenience of these homes. Compare this gorgeous home to any site-built home and I guarantee you’ll not beat the price per square foot or the joy one gets from having a spectacular home at a price you can actually afford. Thank you so much, Pat and Steve Towers! I appreciate you letting us visit and see your manufactured home remodel. It’s gorgeous! 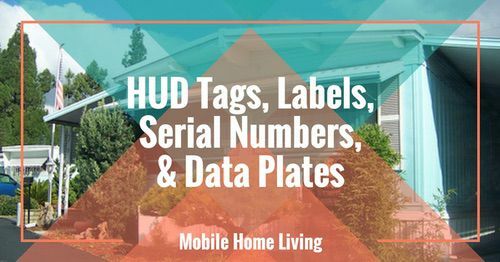 And thank you so much for reading Mobile and Manufactured Home Living! Hope to see you again soon! I do not have a website. This is my Flicker photos page. If you scroll through you will see improvements?? to the walls of my mosaic projects. 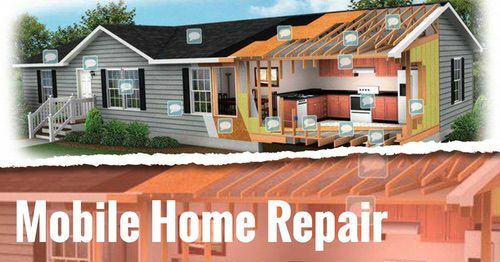 We do not have the $$ to do huge remodels. Husband says the glassed walls save on buying paint. I am far from being featured but some day this will be a quirky Manufactured home. It is a 2008 Fleetwood in Midvale, Idaho. It was a bare half acre, with 6 foot tall thistles on it, when we bought the land. I feel we have come a long way. Your home is awesome! I love it when owners add their own style and that’s the best toilet I have ever seen in my entire life!!! Thank you so much for sharing it with us! I’m a little scatter-brained and behind on writing articles but maybe we can have you teach us how to do mosaics someday? I think it would be a great article! Totally love this! Some befores would have really helped .